When you are away we love your dog to come spend time with us! But when you are in town, you want to bring your dog with you for your own daycare. So do we, so we thought we’d share a local favorite from time to time. 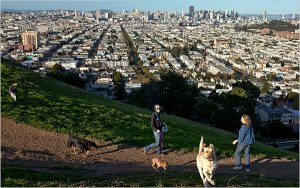 Our first featured furry friendly businesses are all walk-able to our Lodge location in a dog walking tour of Bernal Heights. So give yourself and your dog some daycare on the town! Stop one is Barebottle Brewing Company. Serving up their own beer creations, Barebottle is just minutes from Fog City Dogs and a neighborhood jem. We regularly run into lots of our neighborhood pups here. Its also kid friendly until 8pm so you can bring the whole family. They have water bowls down for dogs, and games like corn hole, ping pong and foosball for humans. Also they normally have a revolving food truck or two out front to feed you. This neighborhood spot stocks all the essentials a pet owner would need and we have found the staff are friendly and helpful. If you want to eat with your dog at your feet. The patio rocks at Bernal Star. They have great burgers and hip vibe that makes this a fun place to hang out with a four legged friend. No dog walk in San Francisco can surpass the views from summit of Bernal Heights Park. Swing the swing while your dog roams the fields up here, just beware the foxtails and occasional coyote sightings after dark. Reward yourself for your hill climb with a night cap at dog friendly Holy Water. They serve great cocktails and a always have 3-4 local beers on draft. We hope you see why we call this area a dog’s home away from home!